The region needs a comprehensive strategy to mitigate the dangers of excess water and increase the ability of working lands to withstand and recover from extreme precipitation. Contingency planning will be complex and constantly evolving, but it must do these three things to be successful. Too much water puts lives and livelihoods on the line. I’ve been checking in with my farmer friends and advisers in the region. Thankfully, they were spared the worst of the flooding, but many of their neighbors were not. Producers are dealing with heartbreaking losses of livestock during calving season, grain bins full of crops waiting for sale, and fundamental transportation infrastructure literally washed away. It’s unclear if they’ll be able to get into their fields in time to plant this year’s crops. The economic impact is staggering. Nebraska and Iowa face upward of $3 billion in losses, and these numbers will grow as floodwaters recede and inundated areas can be better assessed. Floods hit farmers when they could least afford it, layering additional losses on top of low commodity prices, trade wars and record-setting bankruptcy filings. 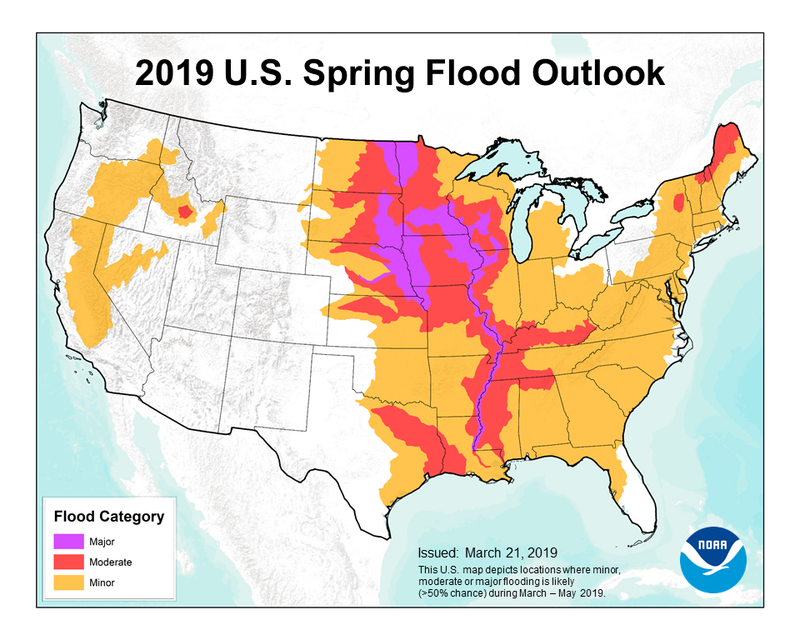 Spring flooding is a recurring challenge across the Midwest, but this flood was particularly severe due to a perfect storm of late-season snowfall, rapidly melting snow and ice, and rain falling on already saturated, frozen ground. Water couldn’t filter down so it spread out in sheets across the land, overwhelming waterways and infrastructure. As floods become more common, risk mitigation and resilience planning efforts must account for storms of varying sizes. The agricultural landscape can mitigate smaller-scale floods through in-field conservation practices like cover crops that increase soil permeability and edge-of-field practices like buffers, filters and wetlands that slow and absorb water flowing across the landscape. The Iowa Watershed Approach, managed by the Iowa Flood Center, is a great example of a program that supports farmers and communities in adopting voluntary conservation practices that reduce flooding and improve water quality. Started by a Housing and Urban Development grant in 2010, the program has grown into a $97-million statewide effort to reduce flood risk across nine watersheds. Conservation practices, however, are a drop in the bucket when it comes to catastrophic flooding. Increasing resilience to extreme flooding requires system-wide changes to the management of rivers, floodplains, agricultural lands and cities. These floods are yet another wakeup call that traditional ways of farming and disaster recovery aren’t enough. I’ve been hearing from more farmers that the regularity of unusual and extreme weather makes it clear that survival requires new approaches. We know some of these approaches — community-level planning for water management, precision management to better use nutrients in changing weather patterns, cover crops and conservation tillage to better sustain yields in unpredictable rainfall, and wetlands and filters to absorb and slow down water flows. But we still have a lot to learn about making room for water in a changing climate. We need policies and support networks that allow communities, states and regions to test new approaches, scale what works, and respond when disaster hits. Proactive risk management is essential to the continued health, wellbeing and prosperity of agricultural, rural and urban communities. This entry was posted in Climate Resilience, Sustainable Agriculture and tagged farms, flood risk, Midwest, resilience. Bookmark the permalink. Both comments and trackbacks are currently closed.